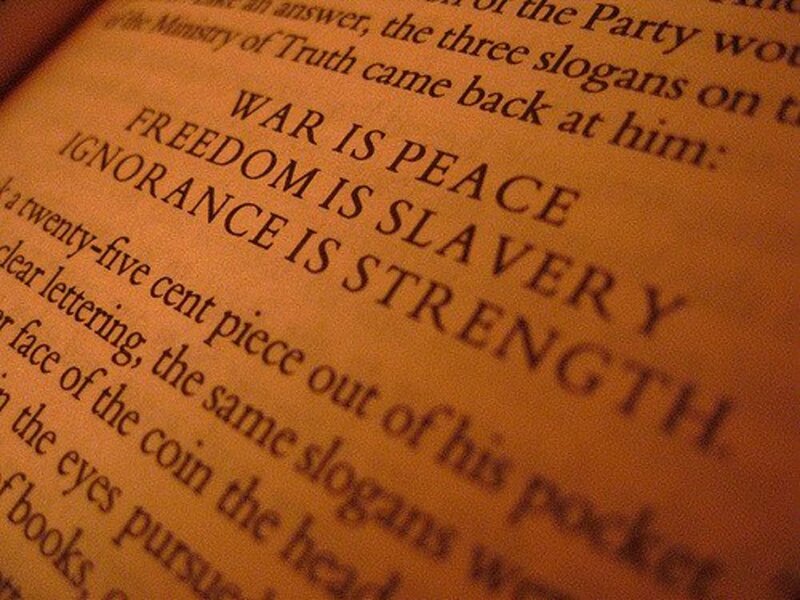 In the original canon of Sherlock Holmes stories, as written by Sir Arthur Conan Doyle, there are 56 short stories and four full length novels. Many of these stories are famous, like A Study in Scarlet or the Hound of the Baskervilles, but if anyone was asked to name further Sherlock Holmes cases, it is likely that A Case of Identity would be missed. A Case of Identity is one of the earliest Sherlock Holmes stories, but is a case that doesn’t deal with a crime, at least in the legal sense, and so is not as sensational as other cases solved by Holmes. 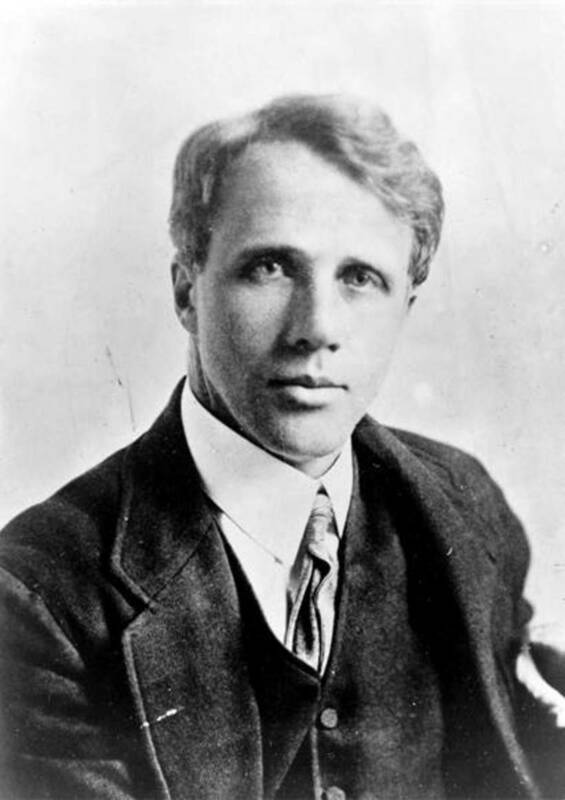 Published in September 1891 in the Strand Magazine, A Case of Identity was the third short story to appear the monthly magazine; the previous month, The Red Headed League had been published. A Case of Identity would be reprinted in the compilation work, The Adventures of Sherlock Holmes in 1892. The characteristics of Sherlock Holmes and Dr Watson had already been well established by Sir Arthur Conan Doyle in the preceding novels and short stories; and so Conan Doyle spends little time in A Case of Identity in adding any background information about the pair. That being said, Conan Doyle does allow Sherlock Holmes to make use of his observational skills, and has the detective establish the profession of his client, Miss Mary Sutherland, just through what he can see. 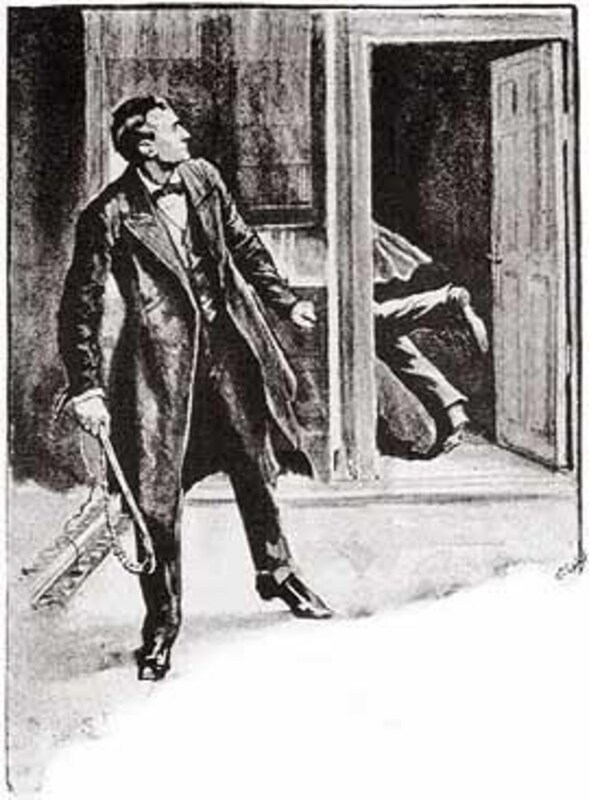 In the preceding stories, Holmes has dealt with murder and bank robbery, and now he is faced with the case of a disappearing fiancé; is it a case of kidnapping? When Mary Sutherland tells of her problem, Dr Watson is at a complete loss, but Holmes manages to solve the case without even leaving 221B Baker Street. In the earlier cases told by Conan Doyle, Holmes had always left his rooms to gain evidence to support his theory; but A Case of Identity all the evidence required comes to him. A Case of Identity is an easy read, fast paced, and highlights the skills of Sherlock Holmes, but despite this it is a story that is often overlooked in the canon of Holmesian stories. 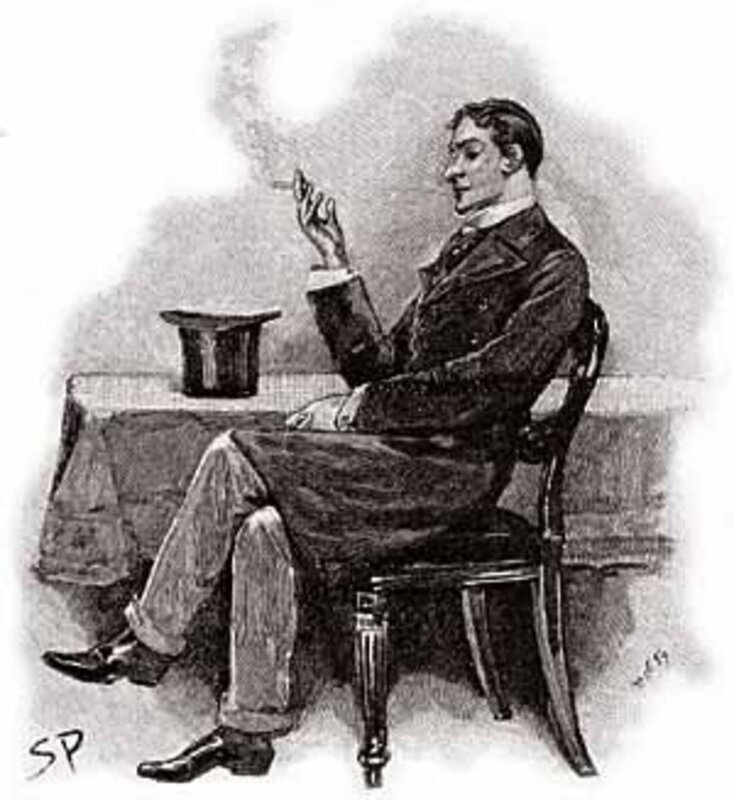 One of the reasons why A Case of Identity may not be as famous as other short Sherlock Holmes stories is that it has not been adapted for stage and screen to the same degree as other stories. A Case of Identity is one of the few stories that was not adapted for the Granada series starring Jeremy Brett as Sherlock Holmes. The basic premise of the story though, does appear briefly in The Empty Hearse the first episode of the third series of Sherlock. A Case of Identity opens with Dr Watson visiting his old friend Sherlock Holmes, in the rooms that the once shared at 221B Baker Street. Holmes is as busy as he has ever been, but the detective is yearning for a case where he can really put his powers of deduction to good use. The sensational stories that have been printed in the newspapers all seemingly have obvious solutions, or at least the solutions are obvious to the world’s only consulting detective. Soon, a potential client is spotted loitering by the front door of 221B Baker Street; the woman seemingly undecided about whether to consult Sherlock Holmes with a problem. 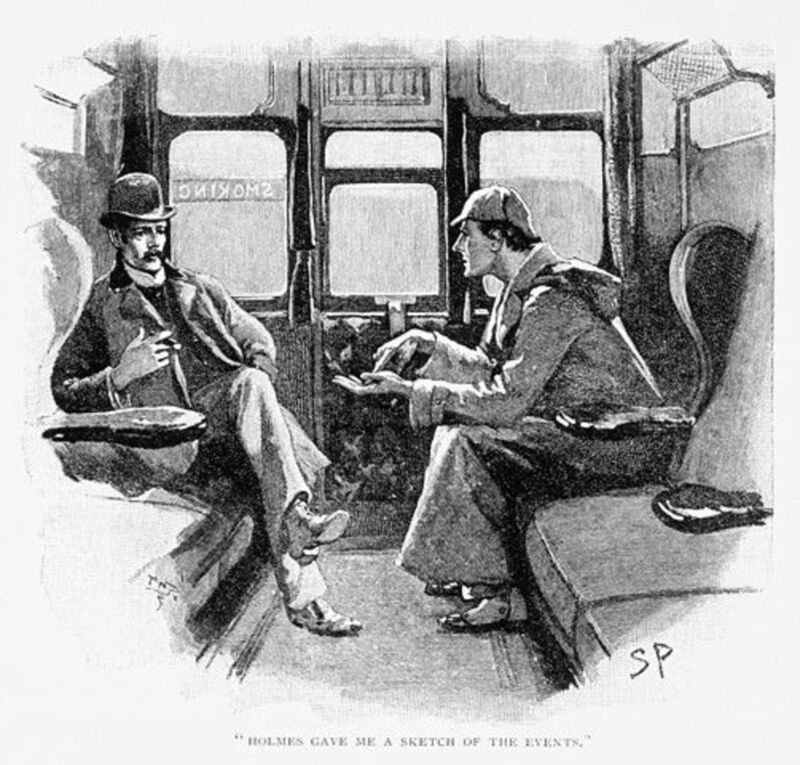 This hesitation is taken by Holmes to mean that it is a case involving love, and initially Sherlock Holmes is heartened by the thought of an intriguing case. The young woman eventually decides to enter the residence of Sherlock Holmes, and she identifies herself as Miss Mary Sutherland. Holmes immediately astounds his new client by identifying her as a typist. Mary Sutherland has brought Holmes a problem of the disappearing fiancé. Mary Sutherland is a relatively well off young woman, receiving a regular wage from her typing, but also a good income from stock left to her by her uncle. At the moment though, Miss Sutherland hands over all of her income to her mother and stepfather, James Windibank, as she lives at home. Mary Sutherland does intend though, to get marry at some point, and then all of her income will be her own. Up until recently James Windibank had been reluctant to allow Mary to mix with people outside of her family circle, and so she had little opportunity to find a man that she would be willing to marry. This situation had changed though, when Mary Sutherland had attended the Gasfitter’s Ball when her stepfather had been out of the country on business. At the Ball, Mary had met a young man called Hosmer Angel, and the two had started to see each other. Mary Sutherland is infatuated with Hosmer Angel, but she apparently knows little about him. She describes him as a strange man, quietly spoken, and often secretive. Hosmer Angel will only meet with Mary when dusk has fallen, he sports long whiskers, and wears tinted glasses. Any correspondence that Hosmer sends to Mary comes in the form of typewritten letters, and when Mary wishes to write back, she has only a Post Office address to write to. Mary Sutherland has no idea where the man she is so infatuated with lives, nor where he works. One final strange fact about Hosmer Angel is the request he made of Mary, as Hosmer asks that she should always be true to him, no matter what occurs. Eventually, Mary had told her stepfather about her time with Hosmer Angel, and although Mary initially fears that James Windibank will be angry, her stepfather is actually supporting of the relationship and the upcoming marriage. When the day of the wedding comes, the strangest event yet occurs. Hosmer Angel enters a Hansom cab to go to the church, but when the cab arrives, Hosmer Angel is no longer inside it. Whilst Holmes had hoped for an intriguing case, the detective has solved it before his client has even finished her story. There is no need for leg work in this case, and Holmes simply advises his client to forget about her fiancé. Mary Sutherland though will not do this, and with the promise made, she intends to be true to him for ten years at least. Holmes might have solved the case, but Watson is still in the dark. Holmes though decides to bring the case to a satisfying conclusion by writing a note to James Windibank asking him to come to Baker Street. Once Holmes explains his solution, the case is of course blindingly obvious; in Holmes’ eyes, James Windibank and Hosmer Angel are the same person. The description of Hosmer Angel is that of a man in disguise, the fact that Hosmer Angel is only around when Windibank is away is also indicative, and the fact that Windibank has a financial motive for keeping Mary Sutherland at home is almost conclusive. Hosmer Angel had simply disappeared by exiting from the opposite door of the Hansom Cab to the one he entered, and then the disguise was taken off, removing the last traces of Hosmer Angel. The conclusive proof to Holmes’ supposition comes when James Windibank sends a typewritten letter to Holmes, accepting the invitation from the detective. Comparing the note to one written from Hosmer Angel to Mary, Holmes is in no doubt that they were typed on the same machine. 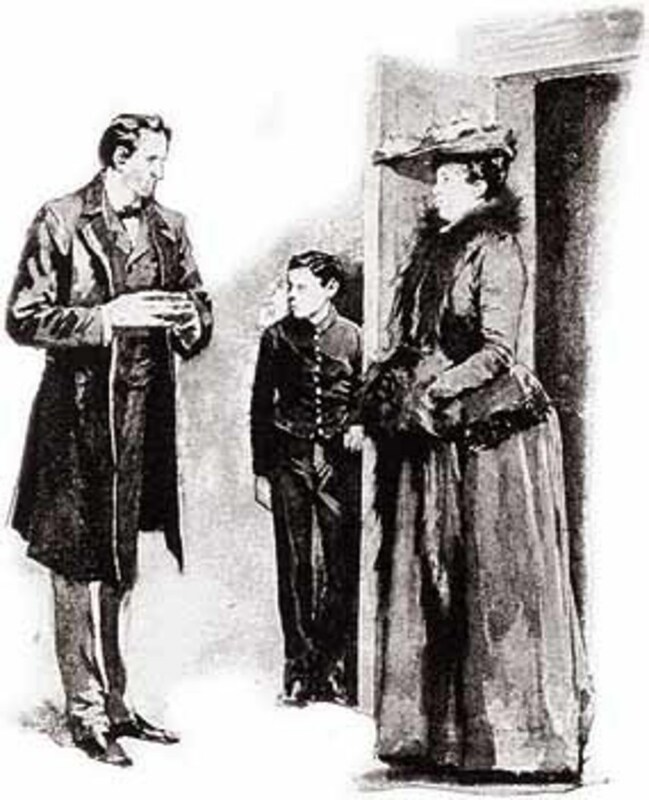 When Windibank arrives at Baker Street, Holmes informs Mary’s stepfather than he knows all about the deception, and whilst Windibank has committed no crime, Holmes still threatens to horsewhip the man for his conduct towards his stepdaughter. Windibank hurriedly leaves Baker Street, but Holmes says to Watson that he expects that Windibank will soon embark on a criminal enterprise, an enterprise that will see him hanged before too long. 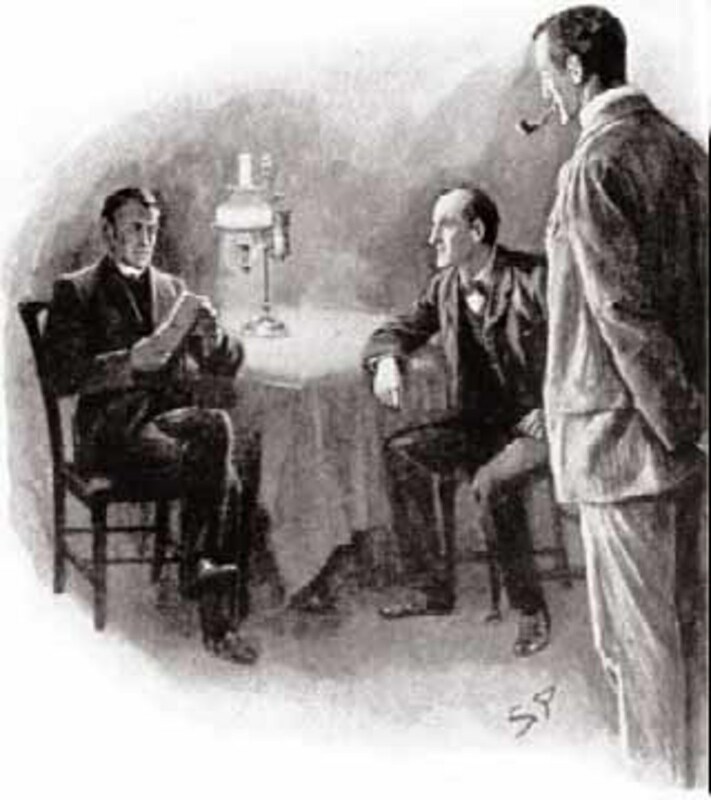 Holmes also decides not to tell Mary Sutherland about what he has uncovered; believing, probably rightly, that his client will not believe him anyway. How does Sherlock Holmes find that Windibank was Hosmer Angel in "A Case of Identity"? Having not left Baker Street to investigate, it is purely a matter of deduction that leads Holmes to believe that James Windibank and Hosmer Angel are the same person. With it evident that the description of Angel is of a man in disguise, and the fact that Windibank and Angel have never been seen together, then the likelihood is that they are the same person. Additionally, with Windibank having a financial motive to prevent Mary Sutherland from marrying then it is almost certain that Holmes is correct. Where did Miss Sutherland meet Mr. Hosmer Angel in "A Case of Identity"? 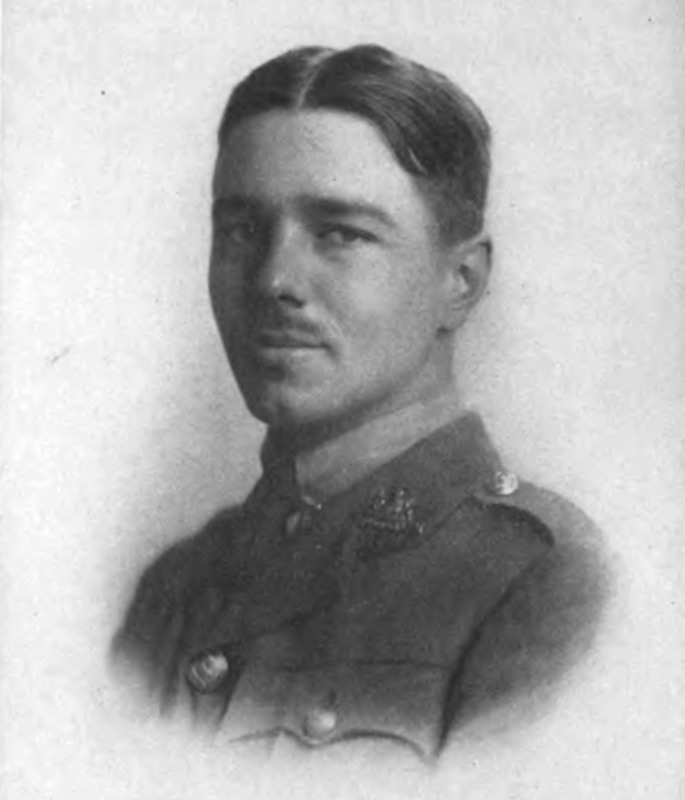 Mary Sutherland would meet Hosmer Angel at the gas-fitters ball, an event to which Miss Sutherland and her mother had been given tickets, for Mary Sutherland's father had been a plumber with a successful business.